Erick “Indio Brabo” da Silva, 29, of Manaus, Amazonas, Brazil and Guram Kutateladze, 26, of Georgia will compete in the lightweight division in the 16th event of Brave Combat Federation, which will feature 11 bouts. It will be the fourth bout of the evening. “Brave 16” will take place at the Mubadala Arena in Abu Dhabi, United Arab Emirates on September 21, 2018. It will mark Kutateladze’s Brave CF debut. 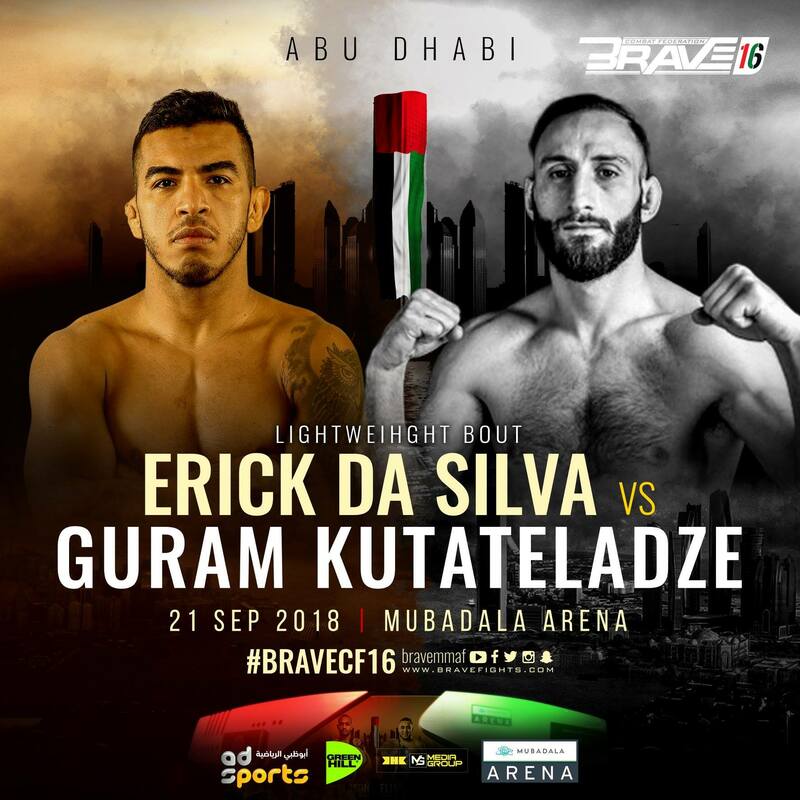 Kutateladze was originally set to face Abdul Kareem “Pride of Palestine” Al Selwady, 23, of Amman, Jordan at “Brave 16.” However, the latter had to pull out of the bout due to an injury and was replaced by da Silva, who is now competing in Brave CF for the fourth time. The only opponent da Silva failed to defeat in Brave CF was Al Selwady. The Jordanian mixed martial artist of Palestinian descent knocked out the Brazilian fighter at “Brave 9: The Kingdom of Champions” on November 17, 2017. With a professional MMA record of 22 wins and 5 losses, da Silva is one of the most experienced fighters in the lightweight division of Brave CF. Recently, the promotion confirmed that the reigning champion of the division, Ottman “Bulldozer” Azaitar, 28, of Germany has been stripped of his belt due to inactivity. On the other hand, Kutateladze trains at Allstars Training Center in Stockholm, Sweden. The Georgian MMA fighter has 8 wins and 2 losses. Out of Kutateladze’s 8 wins, 5 came by knockouts. He is now riding a five-bout winning streak. In the main event of “Brave 16,” Jarrah “The Jordanian Lion” Al-Selawe, 26, of Jordan will challenge reigning Brave CF Welterweight Champion, Carlston “Mocambique” Harris, 30, Guyana. In the co-main event, Bubba Jenkins, 30, of the United States will challenge reigning Brave CF Featherweight Champion Elias “Smile” Boudegzdame, 24, of Algeria.